Bulgur wheat as I have mentioned in my earlier bulgur recipes is very popular in Middle East. I love it as it cooks faster and is so versatile. You can make khichdi, salad, biryani, pulao, upma etc with bulgur. I personally do not prefer eating rice everyday. I include a variety of grains and bulgur is one of my favorites. Bulgur is high in fiber and low in calories. As I love upma, I often make South Indian style upma with bulgur and it tastes awesome. 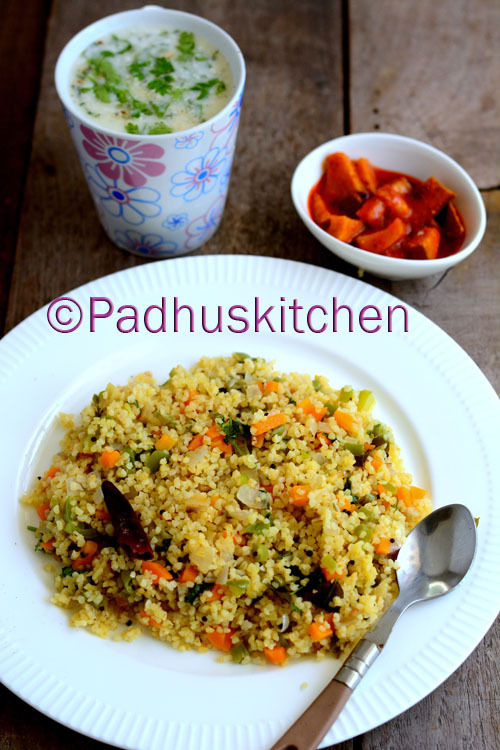 Today we will learn how to make bulgur upma following this easy recipe. Wash and cut all the vegetables into small pieces and keep it ready. Wash and place bulgur in a bowl. Add a little salt (1/4 tsp) and a cup of boiling water to the bulgur. Mix it well and keep covered. Let it sit for 15-20 minutes. After 20 minutes, the bulgur would have absorbed all the water.Drain excess water if any. Fluff it with a fork and keep aside. Heat oil in a pan, add mustard seeds, when it splutter, add urad dal, red chillies, hing and curry leaves. When dal turns golden brown, add finely chopped onions, green chilli and ginger. When onion turns transparent, add the vegetables (except capsicum), needed salt and cook covered on medium heat. Sprinkle water if required. Stir in between for even cooking. Once the vegetables are cooked, add the capsicum and cook for a few more minutes. Add the bulgur, mix well and cook covered for 3-4 minutes. I had this upma for lunch along with a glass of spiced buttermilk (masala chaas). Try this simple, healthy, nutritious and filling upma either breakfast, lunch or dinner and give me your feedback. Check out more Bulgur Wheat Recipes and Cracked Wheat Recipes. Nice post. like the use of Bulgur wheat as Upma. Will try recipe and give feedback.